Wide Mallet. 40mm heads for Low Fret Fretwork. 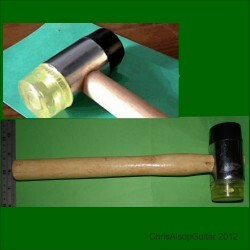 This mallet has faces of 40mm diameter - it total weight is 600g - the handle is wooden and is 280mm in length. It has a soft and hard rubber ends. The ends are able to be unscrewed and replaced. This mallet is an inexpensive soft headed mallet. It can be used for fret installation and its width means its best suited to mainly the low fret end of the fretboard where there is room for its 40mm. Only light taps are necessary as its relatively high weight and gravity does most the work. 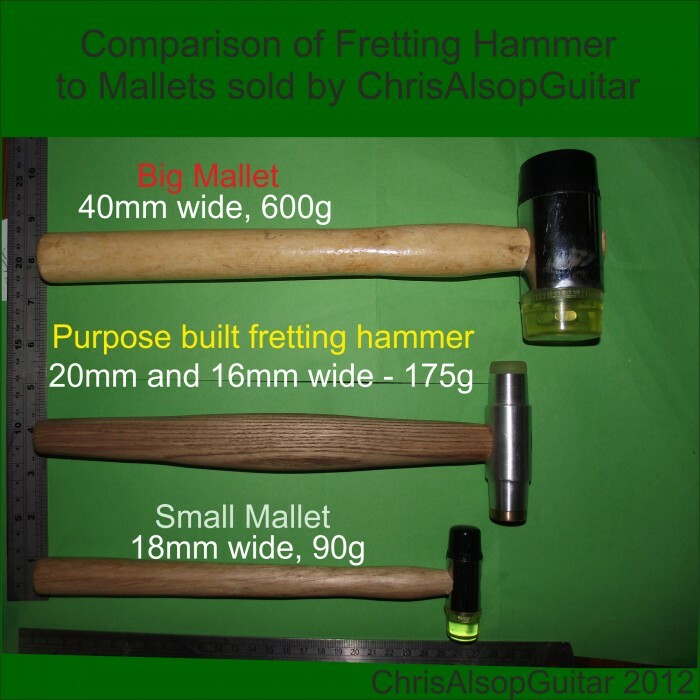 Many sales of this for fretwork make us confident in recommending this general purpose soft headed mallet for low fret fretwork. The heads - one soft and one hard- are really useful so you can go gently to start with the soft head and then issue a few well positioned strikes to make sure the fret is fully driven into the slot - with the hard head.